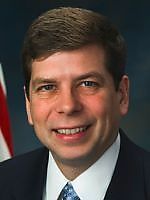 Info Mark Begich was sworn in as Anchorage's mayor on July 1, 2003, following the broadest public transition process in municipal history. The first municipal mayor born and raised in Anchorage, Mark was elected on April 1, 2003, after campaigning on the issues of jobs and a strong economy, better schools, safe neighborhoods, and the promise that Anchorage is a great place to live and raise a family. Mark, 41, is a 20-year Anchorage businessman. He owns and operates several Anchorage businesses, upgrading commercial buildings and renting affordable housing to nearly 100 Anchorage families. His wife, Deborah Bonito, owns and operates three retail stores, which feature the products of more than 130 Alaska craftspeople. From his parents, Mark learned the values of hard work, strength of family, and commitment to community. These are the values he has applied to a successful business career and long record of public service. He founded the Making a Difference Program, which seeks to set straight first-time juvenile offenders; 90 percent of the youth who go through the program do not re-offend. He has served on numerous boards, including the Boys and Girls Club, Spirit of Youth Foundation and Family Resource Center. As chair of the statewide Alaska Student Loan Corporation, he applied sound business practices saving the corporation from bankruptcy and ensuring affordable student loans for Alaska's college and vocational-technical students for years to come. He is a corporate member of the Association of the United States Army, a life member of the National Rifle Association and served on the board of the Resource Development Council. Mayor Begich was named Alaska's top elected municipal official by his colleagues statewide in 1997 and honored as a Friend of Education by the Anchorage Education Association. For his work for drug-free and crime-free neighborhoods, he was recognized by the Mt. View Community Council. Mark was born in the Old Providence Hospital in downtown Anchorage in 1962. He and his wife Deborah live in East Anchorage, have been married 13 years and have a young son, Jacob. 08/18/2020 AK US Senate - D Primary ?? ?